There are 4 x 3 bed dormitory style rooms. Each room has western style en suite bathroom facilities with a hot shower. The Student House is located behind the main Ashram inner sanctum in a serene forest environment. 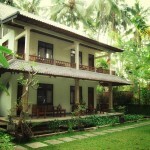 Munivara Student House has been built to accommodate those who wish to undertake spiritual studies at a deeper level. This accommodation is available for either individual guests or disciples to participate in puja, yoga, Ashram sadhana and retreats. The Student House is not a holiday hotel. If you wish to stay at the Munivara Student House there are some guidelines that must be followed. You must participate in Ashram activities and practices. Men and women do not share the same room. See also Etiquette. Guests or retreaters can stay at the Munivara Student House any time during the year, subject to room availability and activities. Student House guests need to organise their own transport and laundry. There is a laundry man who comes to the Ashram for laundry delivery services. Includes: Breakfast, Linen, Yoga and ashram activities. 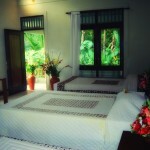 Located in the Student Block within the Ashram Site: Single Bed in a triple bed share room. Includes clean bed linen, a pillow, a towel, bed sheets & bed cover. If you would like to occupy a room on your own, it is possible to book it (subject to availability) at the nightly rate of Rp 495,000 rather then the dorm share price of Rp 210,000. 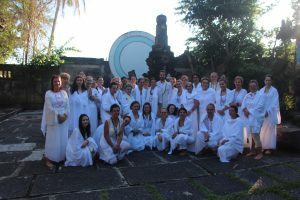 This private room option is unavailable during busy ceremony months, namely May and July, but also subject to auspicious ceremony dates based on the Balinese Calendar, as it is Ashram Munivara’s priority to accommodate as many spiritual seekers as possible to attend the annual ceremonies. Males and Females are to be housed in separate rooms in the Student House. If you are staying at the Student House room on your own and paying the Single Share room rate of Rp210,000 per night, we have the right to assign other people to share your room, of the same gender. Student House guests may not request a room on their own when paying the single share room rate of Rp210,000 per night if there are already other guests staying at the ashram who are of the same gender. Each share room has to be filled before we allow another room to be occupied. Prices do not include travel or health insurance.